Which Fictional TV Characters Would You Happily Live Next To? 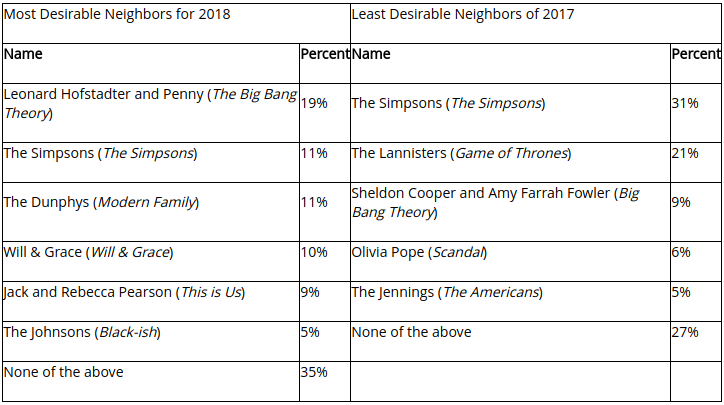 The results of Zillow’s 11th annual Celebrity Neighbor Survey are here, and Leonard and Penny from “The Big Bang Theory” were top choice neighbors for the majority (19 percent) of voters, while the rowdy Simpsons family took the top spot (31 percent) for least desirable neighbor. This year’s survey was a departure from the usual questionnaire, which asks U.S. adults which real-life celebrities they would most like to have as a neighbor. “The Big Bang Theory is one of the most popular shows on television, so it is not surprising that American adults chose its leading couple as the most desirable neighbors for 2018,” said Jeremy Wacksman, chief marketing officer at Zillow, in a statement. “On the other hand, it wouldn’t be easy to live next to the Simpsons, who have spent nearly 30 seasons causing chaos for neighbor Ned Flanders and the rest of Springfield. Leonard and Penny of “The Big Bang Theory” got favorable ratings from voters across genders, generations and education levels, but the couple was slightly less popular among West Coast voters, nabbing only 16 percent of their votes. The Dunphys from ABC’s “Modern Family” came in second (11 percent) on the most desirable neighbors list, and Will and Grace of the updated eponymous TV series came in a close third (10 percent). Jack and Rebecca Pearson from NBC’s “This is Us” and the Johnsons from ABC’s “Black-ish” rounded out the top five with 9 percent and 5 percent of the votes, respectively. While the Simpsons were rated least desirable neighbors from television, there was a slight generational divide: only 24 percent of millennials rated the Simpsons family as the “least desirable,” compared to 38 percent of baby boomers who said the same. The murderous Lannisters from HBO’s “Game of Thrones” came in second (21 percent) on the least desirable list, followed by Sheldon Cooper and Amy Farrah Fowler from “The Big Bang Theory” (9 percent), Olivia Pope from ABC’s “Scandal” (6 percent) and the Jennings from FX’s “The Americans” (5 percent).